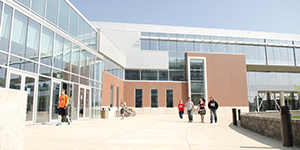 The Student Fitness Center and McCormick Hall is a large, shared use facility occupied by Campus Recreation, Health Promotion and Wellness, and the School of Kinesiology and Recreation. This 170,000 square foot facility provides extensive recreational opportunities for the campus community with over 22,000 square foot of cardio and weight training space, four fitness studios, multiple sport courts, an indoor track, swimming pool, climbing wall, and much more. The facility also includes a variety of classrooms, laboratories, and office space. The Board of Trustees approved the construction of the Student Fitness Center and McCormick Hall (SFCM) at a cost of $43.9 million on October 26, 2007. On July 2008 Board of Trustees meeting, the project amount has increased to $49.6M. The 170,000 sq. ft. facility opened for spring 2011 and serves Campus Recreation, the School of Kinesiology, students, faculty, and staff.